Zululand Birding Route is the first BirdLife South Africa avitourism project, it has been running for more than a decade focused on conserving our birds and their habitats by developing and promoting birding tourism (avitourism) in the Northern Kwazulu-Natal region; which is helping conserve birds in Zululand by giving them direct financial value and is able to carry out this role of socio economic development and conservation work in Zululand through generous sponsorship from many bodies. To date the Zululand birding route has trained and mentored over 35 community bird guides for the route resulting in ten fulltime tourism/nature related jobs and eighteen SMME; marketed the area exhibiting in trade shows nationally and internationally, finalist for the Smithsonian Institute sustainable tourism awards in 2003 and made considerable progress developing birding infrastructure in the Northern Kwazulu-Natal region. World-famous birding venues provide forest, grassland, wetland, bushveld, mountains, estuarine, coastline and open ocean habitats, making this southern Africa’s most diverse area for birding. 63 southern African endemic or near-endemic species are present, making this region a must on any birders’ wish list. Southern Zululand, a premier forest birding route, is home to a great diversity of bird species. Starting on the warm coast of Zululand between Mtunzini, “place of shade,” and Richards Bay, the route moves inland through estuarine swamp forest up to coastal scarp forest in the foothills of Eshowe. 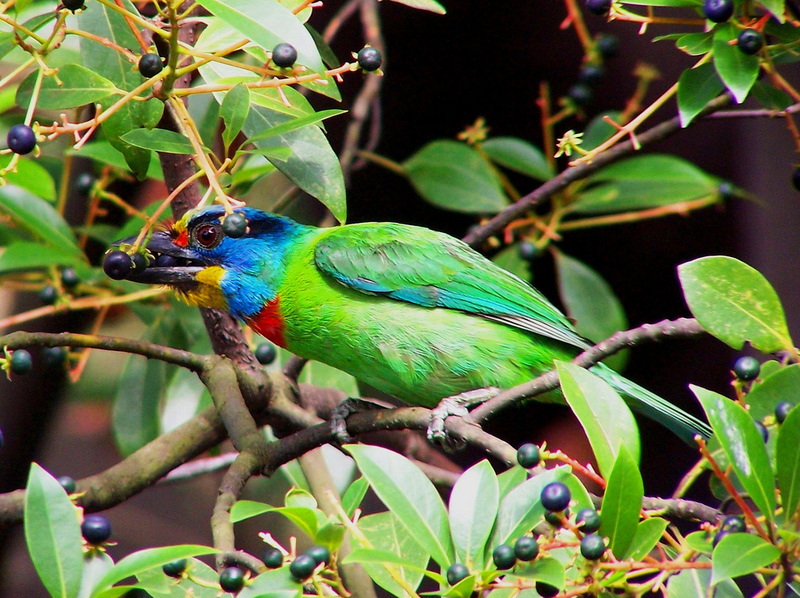 Surrounding Eshowe are a number of forested regions where the endemic Green Barbet of Ngoye Forest is just one of many forest specials which inhabit this region. Further inland are the towns of Melmoth and Nkandla, which, although are in the mistbelt, drop sharply down to dry thornveld habitat providing a range of cliff faces where Lanner Falcons, Rock Kestrels and Bald Ibis breed annually. This area is also rich in Zulu history and culture. Along with the birding routes are self-guided hiking trails and many historical monuments. For the wildlife enthusiast, this region doesn’t host the big five, but on foot, encounters with the diminutive Blue Duiker on the forest floor, and in the canopy, Samango and Vervet Monkeys sharing their meal with Delegorgue’s Pigeons and Trumpeter Hornbills, are not uncommon. This region, which includes swamp forest, dune forest, coastal scarp forest, and the mistbelt forests of Nkandla (at 1200m), are joined by a network of river valleys and rolling grasslands which make for some breathtaking scenery. Whether you’re a birding enthusiast or simply enjoy the outdoors, the Southern Zululand birding route is a gold mine of diversity. There are deserted gold mines too, so whatever your quest, prospect here and you’re bound to be rewarded! via Zululand Birding Route Home. We are coming to ZA. and specifically St. Lucia and the Sani Pass. St. Lucia on February 14 and 15 and the Sani pass on friday the 17th. Can you recommend birding guides or send us to some website that can?